‘Ordinary’ sounds mundane, uninteresting, commonplace by definition. Waking up on an ‘ordinary’ morning, it’s easy for me to take the day for granted, to move on into it on automatic. But life is a series of moments, most of them our own version of ordinary. And, mundane or not, each day behind me is a day I won’t get back. So, ordinary days matter. They matter a lot because most of us have a lot of them. They deserve and warrant attention, tending, appreciation. Events like marriages and births, spectacular adventures and moving to a new town have power that permeates our lives in ways that we can identify as big moments when our path took a dramatic turn, impacting everything going forward. The effect of our ordinary days is more subtle, but it persists. It saturates how we view ourselves and our endeavors. It’s difficult to be present with what seems routine and trivial, or some days—annoying and burdensome. I get caught up in busy. I get anxious about my list. My energy frays. All together too often this is my ordinary. And I start resisting it, fighting with it. But right in my hands at that very moment I know something else is available, too. There’s the chance to sink into a detail, an observation, a gratitude. There’s the chance to appreciate an ordinary moment. Chopping the greens for salad, a nearly daily job, I can fill with appreciation for the sharp beauty of a clean cut by the knife given to us years ago as a wedding present. On a routine drive past a neighbor’s, I notice the flower bed he plants every spring has burst into a riot of zinnia blooms, a certain marker of summer, and realize it’s the summer solstice. Recently, I’ve begun buying flowers for myself. I’ve always loved bouquets, but it was an extravagance that I didn’t allow myself. Now, I’ll pick up a bouquet at the farmer’s market or Trader Joe’s. I love handling the flowers, immersed in the scents, the delicacy, the ornateness of each bloom. I adore setting the vase on the dark wood of the dining table. 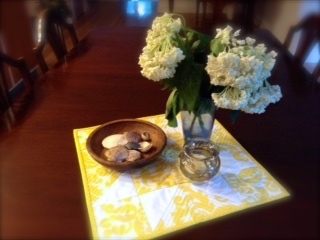 This week, the white hydrangeas there came from a party that my niece and nephew threw to honor their parents’ anniversary. I’m savoring the memory of that event, weaving it into my ordinary days. The cloth we weave of each day becomes the fabric of our lives. In the final year of her life, my mother lost her memory of most of the events of her life, but somehow the cloth she’d created still sustained her. With a bemused yet courageous smile she’d say to us, I’m losing my life, yet I’m certain I had a good one. Small rituals, like buying yourself flowers, tending a garden or a yoga practice, sharing lattes with a friend once a week, add immeasurably to our daily life. Repetition, the very thing that can make us unobservant, is also the thing that adds significance to much of our lives. Years of laying beside my husband has made the sound of his breathing in the dark stillness of the night incredibly precious to me. Being present with why we do what we do and the meaning it has for us gives us purpose. Attending to the everyday stuff gives our lives luster. How are you crafting your good ordinary? What are the small things, perhaps overlooked or taken for granted, that sustain you, that add to your life on a regular basis, that you would miss if they suddenly disappeared? Are there some simple routines you’d like to build into your days, or things you already do that you could do with more attention, more appreciation? What are the little love notes you can send yourself when you tend to something tedious? Maybe you’d like to bring home a bouquet, too. This entry was posted in Connection, Finding Enough, Mindfulness and tagged bouquets, life satisfaction, ordinary. Bookmark the permalink. Lisa it’s funny you should blog about this because I have just started making time for my mocha on the porch to watch the cat stalk birds and the dog lay on the grass and watch the world go by. Nothing special but a nice start to the day! I love this observation–‘Nothing special but a nice start to the day!’ How ideal is that Kate, that your ordinary is something to appreciate. And you are. 🙂 Thanks for commenting.